Verge Center for the Arts is pleased to present We Buy White Albums by Rutherford Chang. For the duration of the exhibition, the gallery will function as a record store stocking only numbered copies of the Beatles’ 1968 self-titled double-LP, popularly referred to as the White Album. But rather than selling albums, the anti-store will solicit additional albums for Chang’s collection of already over 1,600 copies. 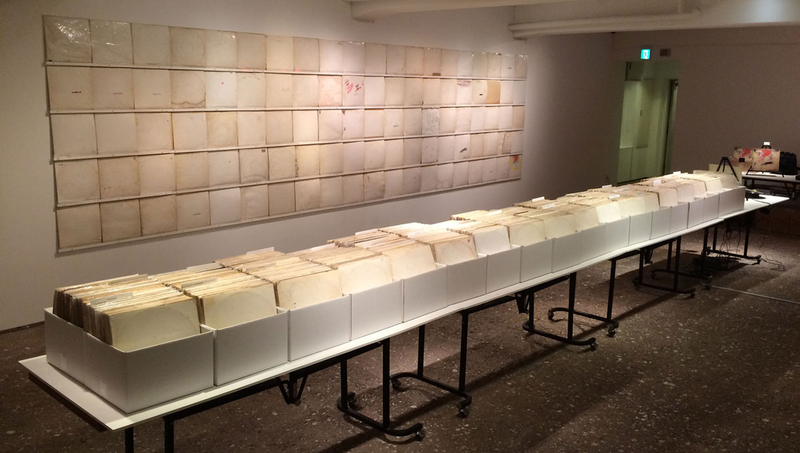 For the past decade, Chang has been collecting numbered copies of the White Album, with its iconic all-white cover designed by Richard Hamilton. The original pressing featured serial numbers stamped on the covers, alluding to a limited edition, though ironically in excess of 3 million copies. Chang’s interest in collecting the White Album lies in how every copy has aged uniquely. Like a blank canvas, the nearly half-century old albums have accumulated doodles and graffiti from previous owners, along with discoloration and mold, turning each album into a one-of-a-kind object. The discs themselves have become warped and scratched over time, creating slight variations in playback. Over time, these albums have become uniform yet unique artifacts. Visitors are invited to browse the albums, listen to the vinyl, and of course contribute their copies of the White Album to the collection. Rutherford Chang was born in Houston and is currently based in New York. He received a B.A. from Wesleyan University in 2002. His work has been exhibited internationally at venues including FACT in Liverpool, Recess in New York, and White Space in Beijing.